Thatcher Bay is located on Blakely Island in the San Juan Islands and was the site of a wood milling operation from 1879 to 1942. During this time, mill waste in the form of sawdust and wood chips was disposed of in the intertidal area. As a result, wood chips in the upper intertidal area had completely buried substrates suitable for forage fish spawning. Lower in the intertidal area, the wood waste was releasing sulfide, a natural byproduct of wood decomposition, at levels that were toxic to benthic flora and fauna. 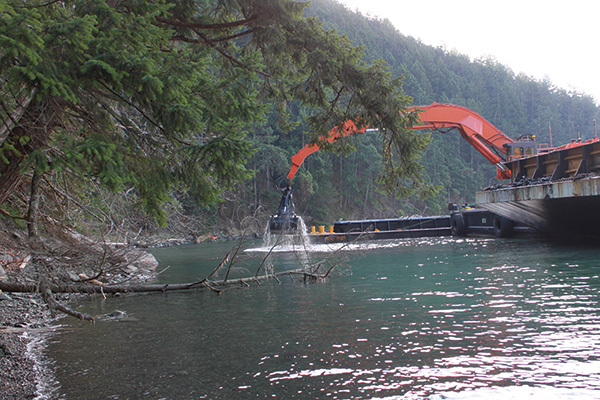 The primary goal of this project was to improve natural processes and habitat function of the nearshore habitat. This goal was accomplished by removing over 11,600 cubic yards of wood waste covering 1.8 acres of valuable nearshore habitat and replacing the wood waste with 11,600 cubic yards of natural substrate matching the adjacent intertidal conditions. Quarterly monitoring of the restoration site, accomplished with the assistance of partners like the Samish Indian Nation, has shown that the project has resulted in restored forage fish spawning habitat on the beach and restored intertidal areas to improve benthic flora and fauna habitat.